Have you ever watched WRAL’s noon news on Fridays? Every week they have a short cooking segment that focuses on NC products. It’s hosted by Bran Shrader, a wide-eyed, fresh-faced reporter who looks like the mischievous kid that might TP the vice principal’s house on Friday night, but show up bright and early on Saturday to help clean it up. His culinary cohort is Lisa Prince, a member of the NC Agriculture Department who acts as guide to all things Tarheel food. Her knowledge is bolstered by an infectious enthusiasm that makes you want to run right into the kitchen and get to work. Lisa also hosts the PBS show, Flavor NC, and a new show celebrating the grape called From The Vineyard. Lisa travels around the state, talking to farmers, chefs, and other diverse folks who have a love for, and connection with feeding North Carolina. 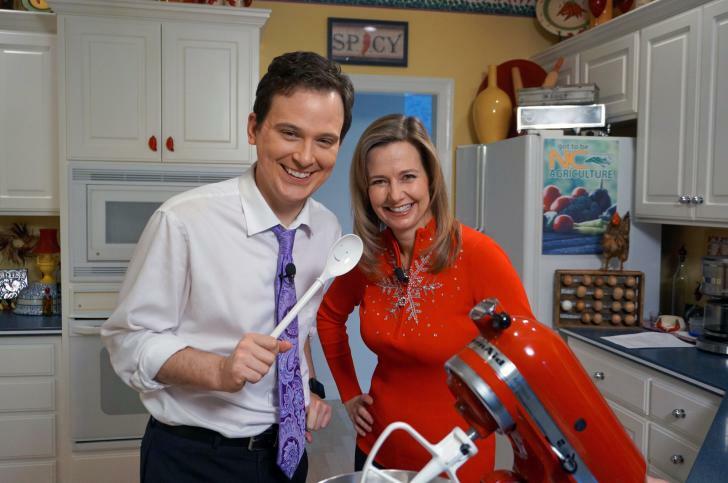 WRAL takes recipe submissions from viewers to make on air. A couple years ago I sent in a recipe and months later Lisa contacted me to let me know it would be made on the show. During our email exchange I told her that I wrote food columns for the Herald Sun. She asked me if I might be interested in judging specialty food contests at the State Fair, which she coordinated. She had me at food. 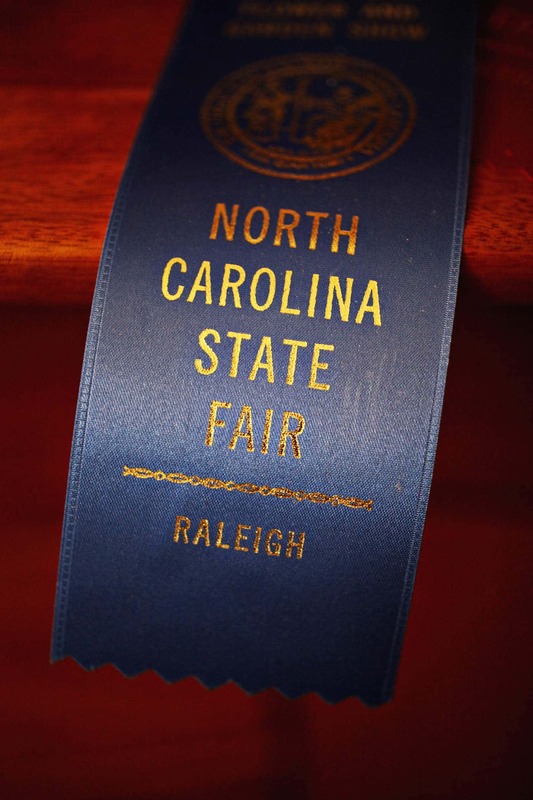 At this year’s fair (my second as a judge) I asked Lisa if she would be willing to have a food chat after the all the state fair business was concluded. Last week we met at La Farm; a carb lover’s paradise, for coffee and a food chat. I started by asking about her TV appearances. Local Dish, her cooking segment on WRAL, is celebrating its 10th anniversary. It started as a one-off holiday episode. It was so popular they eventually decided to air it every Friday. There’s no glam squad and no crew to prep the ingredients. Lisa does her own hair and makeup, and she and her sister do all chopping and measuring themselves. They shoot each episode in her sister’s kitchen, which means familiarity and a working pantry that can supply any missing items. Five years ago a new program was born on PBS, when Lisa was approached to do Flavor NC, an edible travelogue which talks to North Carolina food folk from one end of the state to the other. Now there’s a new show, From The Vineyard. I asked for a recipe and she offered this cornbread recipe that is a favorite of her WRAL partner, Brian Shrader. Here it is, in her words and with her notes. Mix all ingredients together and pour into a greased 9 x 13 pan. Bake at 400 degrees for 35 to 40 minutes, until golden. When out of the oven, top with pimento cheese. *Lisa’s Notes: Be generous with the pimento cheese. It’s the best part. Use a good quality pimento cheese if you aren’t making it from scratch. I also like to use jalapeno pimento cheese for a little extra flavor. This is a great side dish with chili. **Debbie here-the amount of pimento cheese is not specified, but Lisa said ‘generous’ so I would start with 16 ounces and go from there. Lisa Prince is one more person that I have been lucky to get to know because of this gig. And just like almost every other food-related acquaintance I’ve made, she is insanely generous and lots of fun to be around. It’s not just one Thursday in November. Writing this column, meeting the folks, and eating all the amazing food; for me it means that every day is Thanksgiving. Thanks for your time (and I really mean it).